For us with all MH943 Megahome water distillers. These filters are also compatible with many other brands of distillers. 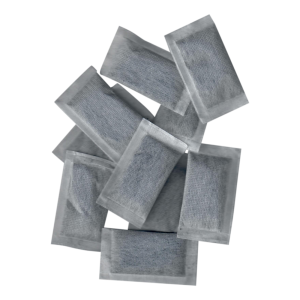 The 12-pack of activated charcoal filters made from coconut shells are a full year supply. NSF-approved activated charcoal filter media. Activated charcoal is effective at removing harmful VOC's (volatile organic compounds). The most common VOC is chlorine which is often used to treat town and city water sources. They also enhance the distilled water, creating the best tasting and purest water. On the average each filer lasts for about 30 days or 30 gallons, whichever comes first. To ensure that you get full use of them, be sure to rinse new filters with your distilled water not your tap water. The filters are made from carbon derived from coconut shells. On the average they last for about 30 days or 30 gallons (113 Liters), whichever comes first. To ensure that you get full use of them, be sure to rinse new filters with your distilled water not your tap water. NSF-approved activated charcoal filter media. For use with our Megahome countertop distiller and others that use a similar filter.